Learn how to make a quick and easy long origami box! Use as drawer organizers, pencil boxes, store small items or use as a gift box. Simple step by step instructions. This simple box is a great starting model for kids and beginners and only takes a few minutes. This box is also very easy to remember once learned. 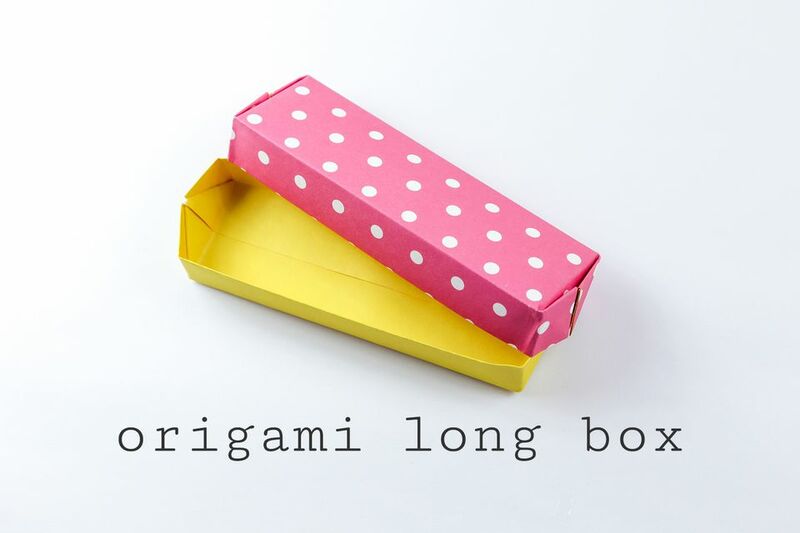 This traditional origami box is a quick way to make a gift box for jewelry, a watch or make bigger ones to make useful sections inside drawers for cutlery, socks or stationery items. This origami box will need some glue or sticky tape if you'd like it to be sturdy, this is a traditional origami model, which doesn't specify glue, but it's an assumption! You'll need one sheet of square paper for each box. Try and use paper that is not too thin, perhaps use thicker gift-wrap or thin card. Start white side up. This side will not be visible from the top or underneath. Fold the paper in half, pinching only the edges to make small marks. Unfold, you can see the little pinches. Fold both the left and right edges to the pinch marks you just made. This is called a 'cupboard' base. 5. Rotate the paper so that it is lengthways. 6. Fold the bottom edge to the middle. 7. Fold the top edge to the middle. 8. Flip the model over to the other side. 9. Fold all four corners in. 10. Flip the model to the other side. 11. Fold the points inwards, using the flaps as a guide line. 12. This what you should have. 14. Refold them as shown. 15. You will need to use some sticky tape or glue to make them solid. The model is done, to make a lid, do the same again. If the paper is thick, use paper that is about 2mm smaller. For example, 15 x 15 cm for the lid and 14.8 x 14.8 cm for the bottom.